The vinegar diet started in the 1800s and involved drinking shots of apple cider vinegar before every meal to aid in weight loss. 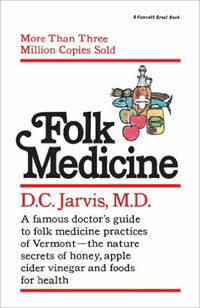 In the 1950s, a country doctor in Vermont (Dr. D. C. Jarvis) wrote a book (Folk Medicine) that set the stage for Apple Cider Vinegar as a weight loss agent. He claimed that regular consumption of the tonic would cause fat to be burned rather than stored. Others claim that the pectin in the vinegar will bind cholesterol and remove it from the body. However, it is all conjecture – this supplement is harmless but is unlikely to offer many health benefits – and will absolutely not cause weight loss without cutting calories. What people call the Apple Cider Vinegar Diet is simply the act of consuming 1-3 teaspoons tonic before each meal in the hope of losing weight. There is very little (if any) evidence proving that this is effective. Even before that, people had been drinking vinegar medicinally due to its strong antibacterial properties. Hey, I even clean with it, so it must be good right! Despite everything we know about weight loss, I have run across some people still drinking vinegar in order to lose weight. Vinegar may promote more stabilized blood sugar levels. Blood sugar stabilization helps to balance energy and hunger levels. Because a person’s hunger is reduced and blood sugar is stabilized, this may then help reduce carbohydrate and sugar cravings leading to fewer calories being consumed. Caution! If you are Diabetic or taking insulin, it is not recommended to take vinegar in supplemental form because we are unsure of the results. Even though the vinegar may help reduce and balance blood sugar, you don’t want to “play around” with those levels. However, diabetic or not, it doesn’t hurt to add vinegar to your salad, or dip your whole grain bread in some balsamic vinegar! Unfortunately, there aren’t any scientific studies that directly link weight loss with using vinegar, but only anecdotal evidence. Vinegar is sometimes used as a homeopathic remedy to lower cholesterol. The pectin in apple cider vinegar (and apples) is a type of fiber that acts like a gel to pull out the “bad” cholesterol. An added bonus: The pectin may stabilize blood sugar as well! This is only true of “unfiltered” apple cider vinegar. Filtered or clear varieties will have little pectin. Unfiltered ACV is cloudy like the far right sample. Other foods high in pectin: beans, oat bran, legumes, carrots, and citrus. There are a large number of health food manufacturers who tout this vinegar as a “miracle” healer. The sad truth is that there is very little evidence to prove any of these anecdotal claims. However, there are a few studies that show some health benefits. See references below. A nutritional breakdown of Apple Cider Vinegar shows that it is actually quite “bland” – rather than being the nutritional “storehouse” that marketers claim. Use caution and ask your doctor before supplementing with vinegar as it can possibly alter potassium and blood glucose levels in some individuals. As with any food, the more natural and unprocessed the vinegar is, the better. Organic, unfiltered, not pasteurized, apple cider vinegar is the best as well as organic balsamic vinegar. ACV is very acidic and strong in flavor, so people have devised some clever ways of taking it. As a shot Apple cider vinegar can eat the enamel of your teeth, so chase the shot with at least 8oz of water to rinse off your teeth. Injury has resulted from this method. Diluted in water The more diluted the ACV the weaker the flavor. Mixed with honey This is a counter productive since you are adding pure sugar calories to your diet. Used as a salad dressing Encourages healthy eating and is a tasty low-calorie dressing. Mixed in Juice Again, you end up drinking a lot of empty calories which is not advisable for weight loss. What Brand of ACV is the best? Any brand that is unfiltered, organic, and unpasteurized with the “mother” seen settling at the bottom. The remedies are based on this type only. Many people recommend Bragg as the best. Should I take apple cider vinegar before I eat or after? Some report that ACV decreases appetite when taken before eating, this is probably because it “sours” the stomach. However, if ACV upsets your stomach taking it after eating will help. If it doesn’t work, why do people lose weight on the ACV diet? The mind is a powerful thing, if people believe in something, it can become reality. This is referred to as the placebo effect. Also, if it sours the stomach when taken before meals, people may eat less than they normally do. Are there dangers from taking apple cider vinegar? Up to 9 teaspoons of ACV a day will probably cause no ill effects, except the danger of teeth erosion if not rinsed with water after drinking. However, those that think more is better could acidify their system, which could lead to other health problems like osteoporosis. Take only the recommended dosage to be safe. I can’t be in the sun. I’ve tried tanners. Leaves me sickly greenish looking and streaks. Skin therapist recommended apple cider vinegar for cleansing, smaller pores etc. Miraculously after about six weeks, my skin face had a glow and was darker. I guess the acv may be dying my skin. Age spots are blending in and seriously people are commenting on how healthy I look. I’m 70. I have no reason to share this information other than to help others who are depressed with their aging face. Wow ..Thanks for sharing information about ACV .I am having Organic Himalayan Apple Cider Vinegar from sattvicfoods.in & totally loved it.It really helped to loss weight. It tells you all that in the article above. Did you mix ACV with Honey? Please share how and when you consumed. The same as many other organic diets: vinegar can really improve your health and your body. This kind of tips always surprise me! I know I always crave carbohydrates. I love pasta and bread! I love sweets and sugary things as well and crave that often. I’ve never heard of taking vinegar as a supplement or medicine to lose weight or for any reason actually. I don’t think I could just drink vinegar though that doesn’t sound too good. You have to be careful with it–it can cause oral/esophageal irritation if you take a lot of it in its pure form. If you plan on taking it every day, it’s better to dilute it or you risk doing damage to your throat/esophagus. Bonus: apple cider vinegar is a great home remedy for yeast infections. You can douche with a solution of apple cider vinegar and water and it’s an all-natural way to get rid of yeast infections. Apple cider vinegar it is also good for facial wash. Take 3 table spoon of vinegar and mix it with 500ml of warm water in a bowl deep a face cloth and pressesd it gentle on and your face reapetetly,it give a perfect face wash and reduces facial fats,and also a feeling of depresion and nevours tension. Do you mean it cleanses skin oils on the face? It certainly wouldn’t do anything for facial fat under the skin.